Tickets: $10 General, $5 Members, Kids 12 and Under Free! Thomas Dimuzio is a musician, composer, improviser, sound designer, mastering engineer, label proprietor, and music technologist residing in San Francisco, California. 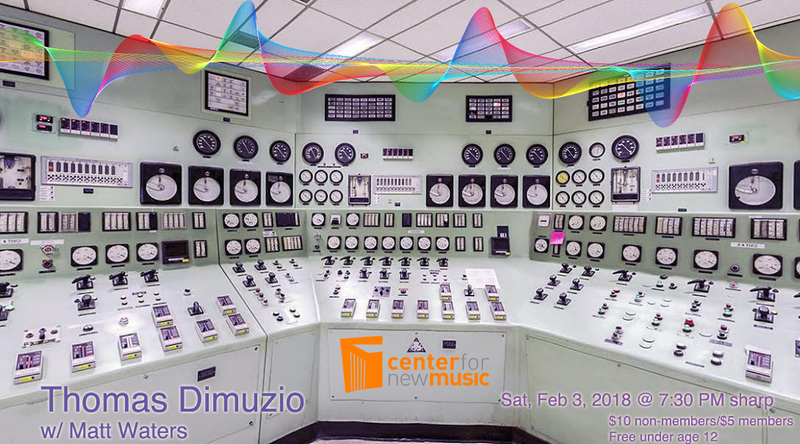 Inspired as much by John Cage as Led Zeppelin, Dimuzio’s music is like a sonic excursion that transports the listener into other worldly aural realms. “His work has a narrative, filmic tug that will draw you into its dark corners, ears alert… brilliant and rarely less than entertaining.” (Peter Marsh, BBC) His recordings have been released internationally by ReR Megacorp, Asphodel, RRRecords, No Fun Productions, Sonoris, Drone Records, Record Label Records, Odd Size, Seeland, and other independent labels. Among his collaborators are Chris Cutler, Dan Burke, Joseph Hammer, Anla Courtis, Nick Didkovsky, Due Process, Voice of Eye, Fred Frith, David Lee Myers, 5uu’s, Matmos, Wobbly and Negativland. In 2015 Dimuzio played at AngelicA Festival Internazionale di Musica as a featured soloist with the Orchestra of Teatro Comunale of Bologna for a performance of Chris Cutler’s “p53”.